Packing up my kitchen and noticed how lovely my arrangement of martini glasses wrapped in newsprint was. Also, can we talk about how pretty newsprint can be? I will come out and say this. I’m not a big reader. There I said it. Should I feel bad? Probably, but there have been very few books in my life that I’ve been able to get into enough to finish cover to cover. When my boss’ mother-in-law lent me a book to read, I almost immediately rolled my eyes. Most books that people recommend are pretty much awful. Nevertheless, it came into my hands and I read it. 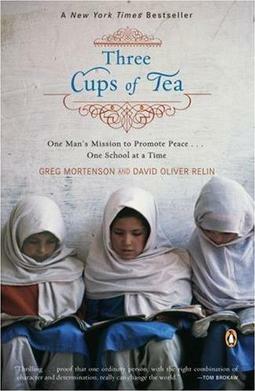 You may have heard of this book, its called Three Cups of Tea and it details the life of one Greg Mortenson. Greg is an American man who made it his life work to educate poverty stricken areas of rural Pakistan and Afghanistan. It first started as a humanitarian effort that took on the new goal of fighting terrorism at the root in a post 9/11 world. The book is mostly written by David Oliver Relin, a journalist whose writing skills transfer well to a lengthy biography. Relin’s words with Mortenson’s voice becomes a powerful combination. The stories of poor villages and especially their children are as predictably heart wrenching as one of those “Feed This Orphan” commercials featuring Reiner or Struthers. However, you take some solace in knowing that there is actually something being done there. Where the book really excels is after 9/11occurs and it becomes a look into how the United States was fighting the war that we are still in. Much of this information was not very new for me but I could imagine many Americans reading this book and being upset, in disbelief or a combination of both. It has the ability to make someone very angry or upset. I would love to see a sort of appendix to Three Cups of Tea. One that details his new schools in Afghanistan as well as the past 5 years or so of war that have occurred since the book was published. I wish that every American would read this book as it is not only extremely well written but potentially life changing. Tom Palumbo was, once upon a time, a staff photographer for Vogue and Harper’s Bazaar. He took many beautiful shots, all of which are visible here. I don’t know what is! As many of you may know, the Burj Khalifa (formerly Burj Dubai) has opened today. It is not only the tallest building in the ENTIRE WORLD, it also had a hell of a ceremony to celebrate it.